This, my friends, is cliche country. We spy our first tumbleweed within half an hour of hitting the road. Soon after, we’re in the midst of a dust storm, and visibility drops to 20 metres – so much for photographing the desert landscapes. Before we turn onto Route 550, however, our first pitstop is Blake’s Lotaburger, a no-frills diner on the outskirts of town, where we tuck into cheeseburgers topped with fiery green chillies. We briefly debate making a detour to Walter White’s house from Breaking Bad, but instead charge on towards Monument Valley, eager to make it to the rust-red Colorado Plateau before sunset. It’s on this single-lane highway that we cross first into Arizona, then into Utah, steering through tumbleweeds and waves of red sand, snapping blurry monoliths out the window. We pull into the View Hotel in Monument Valley with minutes to spare, setting up our tripod in the carpark to catch the sun as it falls behind the majestic Mittens, so named because they resemble thumbed gloves. Set in the Navajo Nation Tribal Park, the View Hotel blends seamlessly with the arid environment, and makes the most of its prime position in the heart of Monument Valley. We dump our bags in our room, then head to the hotel’s low-key restaurant. Simon and I sample the local cuisine, including some odd ‘Navajo tacos’, a mild chicken and green chilli stew and pork posole, flavoured with maize, chilli and lime. Brian, on the other hand, ignores our taunts and opts for the oh-so-authentic ‘Clint Eastwood fried chicken’. It’s early to bed (the Navajo Nation is a booze-free zone), then up at 5.45am to snap the sunrise. After breakfast, we bundle into our massive Chevy Tahoe for the drive around the Tribal Park. The 27-kilometre trip takes in the legendary sandstone buttes of the Totem Poles and Artist’s Point. And although the park is open to all comers, it soon becomes clear this is SUV territory: within minutes we’re helping push a hapless sedan out of the soft sand. Having safely navigated the off-road route, we’re back on the highway and heading towards Page, Arizona. Two hours through the blush-pink desert brings us to Lower Antelope Canyon, a little-known natural wonder in a land of grand scenes. 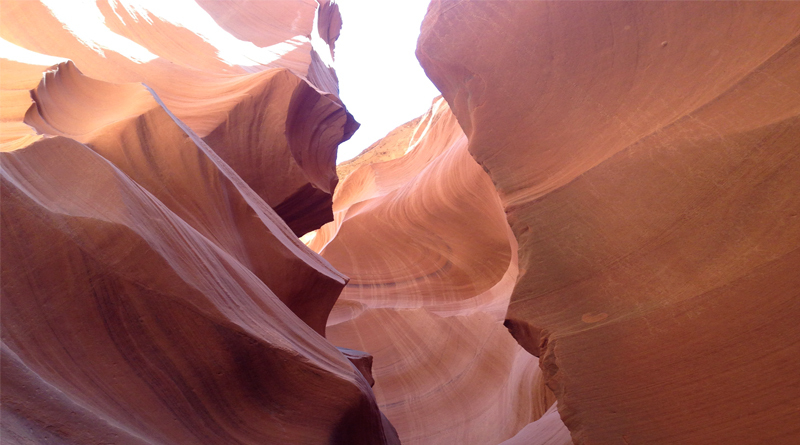 Forged by centuries of flash flooding, the kilometre-long slot canyon is a series of striking, multi-hued sandstone chasms. As we squeeze between gaps in the walls, our Navajo guide points out animal shapes in the rock formations. It’s breathtakingly beautiful. And it’s in stark contrast to the canyon we’re tackling the next day… After a pitstop for excellent pork ribs in Page, we drive on to the El Tovar Lodge at the Grand Canyon National Park, avoiding curious deer in the muted dusk light. This is an edited version of a feature that appeared in the July 2014 issue of Mercedes-Benz Magazine.